We have completed the first three weeks of the school year. So far, it’s going great. We’re doing modern history this year so we started in the second half of the 1800s. We learned about Africa and India and a little bit about the US. We read a book about Elizabeth Cady Stanton. Fritz was horrified at what men thought about women in the 1800s. We’re doing physics this year. We’re using Elemental Science. The boys are loving all the experiments we are doing. We are doing 6-10 experiments a week. We learned about air pressure and water and made hovercrafts. The boys (including Adrian who isn’t specifically taking Latin, but is around when we do it) have learned 5 verbs and 5 nouns and the amo chant and the first chapter maxim in Latin for Children A. We learned about Georgia O’Keeffe and George Frideric Handel. We’ve studied several O’Keeffe paintings and listened to several pieces by Handel. Cameron read Kidnapped by Robert Louis Stevenson and several poems by modern poets. He’s learning to write in cursive. He reviewed nouns. Spelling You See is worked great for him. He started the second level of Writing With Skill. He had worked on two-level outlines and notetaking. He’s started formal logic and vocabulary lessons. He’s completed three lessons of Math-U-See Algebra. Fritz read Homer Price is has read several chapters of The Lion, the Witch, and the Wardrobe. He’s learning cursive and doing well with Spelling You See. He’s reading his own passages for narration now and doing lots of dictation. He reviewed nouns, pronouns, and verbs. He started vocabulary lessons. He’s almost done the third lesson of Math-U-See Delta. He loves division. Adrian is still working through his phonics lessons and using Explode the Code. He likes Spelling You See. He is learning to do narrations. He doesn’t like copywork, but he puts up with it. He reviewed nouns and verbs. He’s almost done the third lesson of Math-U-See Beta. He much prefers the videos to doing the worksheets. Ani’s school year didn’t really start until this week. She had her first Well-Trained Mind Academy classes on Monday, Tuesday, and Friday. She absolutely loves her classes and thinks all of her teachers are great. They are challenging and have a lot of work to do outside of class. Balancing the workload with taekwondo classes (and now she’s been hired to actually work at the taekwondo studio) isn’t easy, but she’s loving all of it. We got Ani’s books for the classes she’s taking from The Well-Trained Mind Academy this year. 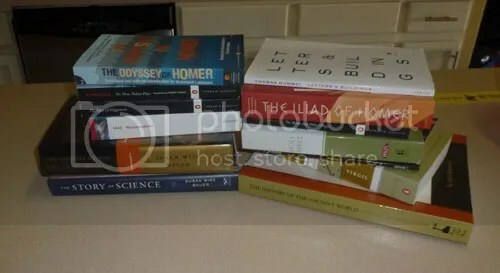 One of the classes she’s taking is ancient literature so she’ll be reading some stuff that looks pretty dreadful to me, but she is so excited to read most of them. Her classes begin on September 8th and she can’t wait!